Sierra Leone’s founding dates back to 1787 when several waves of freed black settlers originating from England, Nova Scotia, and Jamaica all arrived in the area. 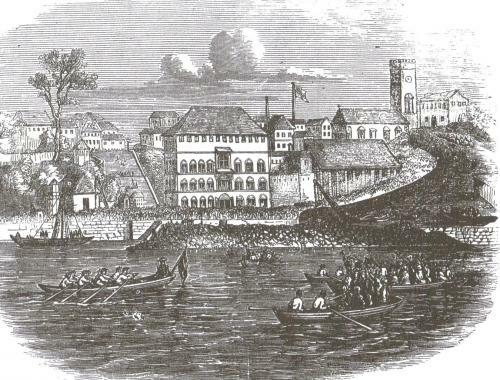 Utilizing some English government funding, The Committee for the Relief of the Black Poor, an abolitionist group which included Thomas Clarkson, William Wilberforce, and Granville Sharp, established the colony with the settlement of 411 London blacks on the Sierra Leone peninsula in what is now modern-day Freetown in May of 1787. That settlement was named Granville Town after Granville Sharp. Sharp also wrote a constitution based on the British legal tradition and on a framework of Christian principles. Two further waves of settlers came in 1792 and 1800 this included 1,200 blacks from Nova Scotia, and 550 Maroons who had been exiled from Jamaica following the 1795 Maroon War. The first settlers faced both environmental and political problems. Diseases and food crop scarcity along with conflicts with indigenous local African communities whose land they had settled on made survival difficult. In 1790 Granville Town was razed to the ground by indigenous people in retaliation for the burning of a native settlement. Though Granville Town was rebuilt by St. George’s Bay Company (later re-named Sierra Leone Company), it was again attacked by the French navy in 1794. Internal settler issues and conflicts also undermined the colony’s stability. The Sierra Leone Company control of food, seeds and other vital supplies and its decision to charge one shilling per acre for land caused the Nova Scotian settlers to rise up in rebellion in 1800. Although this rebellion was eventually put down by British naval forces, the company agreed to limit settlement to the blacks already in the colony. New conflicts with indigenous people over disputed land clams prompted attacks on the colony by the Koya Temne between 1801 and 1807. Sierra Leone became a crown (British) colony in 1808. From that point virtually all of the new settlers were “re-captives,” slaves rescued from slave ships and emancipated by the Royal Navy. Sierra Leone became a base for the navy’s operation and the number of re-captives soon outstripped the number of original freed slave settlers. These re-captives eventually blended into the community, created by the first three waves of freed slave settlers. They formed a unique Krio culture and language with Christianity as its base. By the 1830s Sierra Leone became an important site of missionary activity and education. Freetown, the colonial capital, was known as “Athens of West Africa.” Also by that period, commerce replaced agriculture as the principal source of revenue in the colony. Kenneth Morgan, “Sierra Leone: Origins, 1787-1808,” Richard Fanthrope, “Sierra Leone: Development of the Colony, Nineteenth Century,” Michael Jusu, “Sierra Leone: Protectorate: Administration and Government,” in Encyclopedia of African History, ed. Kevin Shillington (New York: Fitzroy Dearborn, 2005).